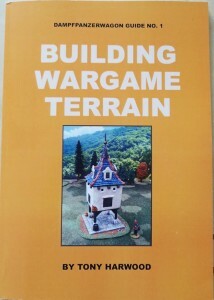 Cianty's Wargame Blog takes a look at the book, "Building Wargame Terrain" by author Tony Harwood. There are a couple talented hobbyists out there who create stunning fantasy/medieval wargaming terrain, such as Wolfgang Jädtke, Trull, Rob Hawkins, theomar pius or Thibo and X-Tine of CT-Scenery - to name just a few*. But when it comes to high quality resin terrain manufacturers the number shrinks drastically. The products from Tabletop World, Stronghold Terrain and GrandManner being my favourites**. With "Building Wargame Terrain", Tony Harwood, one of the top terrain model makers, has now published a book in which he describes his techniques and shows off some of his fine work. Some of his creations are available as resin models from GrandManner. Incidentally, one of them - the Wachau Meeting House from the 28mm Napoleonic Europe range - is currently sitting on my workbench. So naturally I was especially curious to take a look "behind the scenes" and learn about the making-of for these beautifully crafted pieces.